Among the many changes coming up for us includes C going to a Christian school. The public schools in our newly adopted Southern city are not right for him, the charter schools are impossible to get into, and the private schools are almost all religious based. It made for an interesting trip recently when Husband and I did the “great school search,” which is a story for another post. We haven’t brought C up in a church. I’ve always loved the ritual of church, the music, the fellowship, and the calmness. And while I’m a very religious person who prays constantly throughout the day, I’m also an anthropologist by training, and I have a hard time reconciling the flaws of organized religion with the gifts of it. Aside from that, church has been one of those places fraught with potential minefields for C. From going up to the front alone for the children’s message, to being in Sunday school classes with a teacher not equipped to deal with C’s early sensory and communication challenges, we just never thought it would be a good place for C to hang out. Now, however, it’s a different story. C will still stand out like he always does, but I think he’s ready to handle the personal rigors that church will present to him. Moreover, he is interested at the moment. He’s full of questions about God and Heaven. And none too soon, because we’re basically moving to church-town, USA. We will be attending a church, because that’s what people in our new town do. In preparation for all these upcoming changes, I started talking to C about prayer. From the prayer circle in his new class – where at least once a day the kids join hands and share their prayers of concern or thanks – to Sunday school at our new church, C will need to be comfortable with his newfound religion. So I told him about prayer, why people do it, why I do it, and what it means for different people. We got down together on our knees the other night and said our prayers out loud despite his being a little shy about it. Since that night, I have reminded him to say his prayers privately, knowing that he probably was not doing so. I thought I’d give it a couple of days and talk to him about it again. 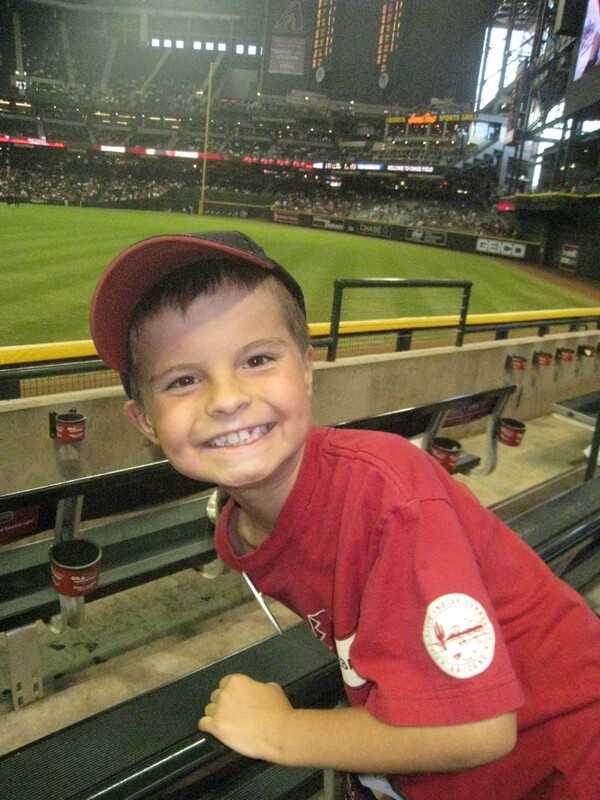 C at his first baseball game. Go Diamondbacks!